I preface the “rings” portion of the wedding ceremony with a brief explanation of the king’s signet ring pressing into the hot wax, sealing and authorizing the royal document. I speak to the bride and groom that the rings are “sealing” the marriage covenant. Prior to the grand event, multiple hours were spent in pre-marital mentoring, the melting of the wax so to speak, unto the moment of the “seal”, the exchanging of the rings. As I mentioned in the last post, every marriage must be watchful that the perimeter not be breached lest the efficacy of the seal be compromised. The Song of Solomon is a deep spiritual allegory containing rich interactive segments of interaction between Jesus the Bridegroom and His beloved. At the culmination of the book He extends this invitation: “Set me as a seal upon your heart, as a seal upon your arm.” This is a beautiful invitation unto purposeful communion. “Set me on your heart by communing with me.” With our Lord and with our spouse, we must be intentional in this regard.The strength of the seal rests on our communing with Him in the present tense. The seal speaks of the power of Jesus released by the Holy Spirit. The love of God poured out upon my heart at salvation, was and is, a “sealing love.” Yet my response to this love will determine how I navigate through trials to arrive at the refuge of sustained hope. (Romans 5:1-5) It is also a progressive sealing – God’s vision over my heart is that I grow in love over the years, being “rooted and grounded” in its surety. “Set Me as a signet (ring) upon your heart” is the literal translation. It reminds me of a couple renewing their marriage vows, more often than not, a re-commitment after enduring a season of testing. Spiritually speaking, I cover this ground with Christ on a regular basis. The seal of God speaks of my spiritual identity, the way in which I am to carry my heart before God. The vigilance that was lacking in Eden inspires me to say, “Not on my watch.” I will not (by the grace of God) allow the perimeter to be breached. I renew my vows Lord. I set You as a seal upon my heart today. While the heart represents my devotion and affection to God, I also want the impression of His signet upon my arm – labors in ministry and the loving of my neighbor. This seal of love upon the arm is a protection against weariness, compromise, and defilement. “Set me as a signet ring upon your heart, as a seal upon your arm, for love is strong as death, jealousy is fierce as the grave.” (Song of Solomon 8:6) “Death and the grave” is a pretty comprehensive and powerful seal; occurrences of undoing are very rare in this life. 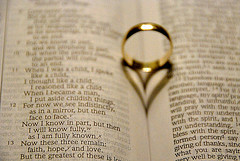 Fierce jealousy is all consuming; full possession is God’s design for our individual lives and marriages. The grave is unyielding; it demands the total submission of all human life. So it is with all those who choose to be “crucified with Christ”, “living sacrifices”, wed and sealed upon the altar of love.